Navin B Chawla (born 30 July 1945, New Delhi) was a long serving Indian bureaucrat. He joined the prestigious Indian Administrative Service in 1969, after sitting a mandatory and highly competitive examination. He served in various Civil Service capacities till 2005, when he was chosen to be appointed to the Prestigious Constitutional position of Election Commissioner of India (2005-2009). He was subsequently appointed as India’s 16th Chief Election Commissioner in April 2009, and stepped down at the Constitutionally mandated age of 65 years. He successfully conducted India’s 15th General Election in April-May 2009*. He was educated at the prestigious Lawrence School, Sanawar (1953-1961) where he took ‘O’ Levels. He later took an Honours course in History at the famed St. Stephen’s College in Delhi University (1962-65). He went on to take a second degree in History at the School of Oriental and African Studies at London University (1965-67) which was, followed by a Diploma in Social Administration at the London School of Economics (1967-68). Several years later he was a Visiting Fellow at Queen Elizabeth House, Oxford (1996-1997). Navin B Chawla is also well recognized as the biographer of Mother Teresa His biography entitled 'Mother Teresa' was first published in the UK ( Sinclair-Stevenjon, 1992 ) and has seen many translations and editions since then. He also co-authored a second book on Mother Teresa called “Faith and Compassion”, a life of Mother Teresa with pictures, published in the UK, ( Element Books, 1997). After his retirement from the Election Commission of India, he was appointed by the President of India as Visitor’s Nominee on the Executive Council of Delhi University and also the Visitor’s Nominee on the Court of Pondicherry University. He is a Trustee of the South Asia Foundation, and an Advisor to the Madanjeet Singh Foundation. Manipal University have also appointed him an Advisor. He is a member of the National Integration Council of India under the Eminent Persons category. 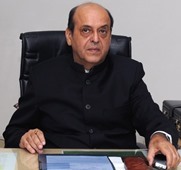 Besides these occupations, he is the Founder Chairman of the “Darshan” (abbreviated) Trust, based in Jaipur, and the Founder Vice Chairman of The Lepra India Trust, situated in New Delhi (see “Trusts”). *	NDTV, a leading News channel, awarded him its “Indian Icon of the Year award for 2009”. Copyright © 2011 Navin B Chawla. All rights reserved.